By default, NutriAdmin divides meal plans into four meals: Breakfast, Lunch, Dinner, and Snacks. However, you can customize these to anything you want, including adding extra meals. This article will show you how to customize the meals of the day for a meal plan. You can setup the default meals of the day you want to use in your meal plans, and you can also change the meals for any given meal plan in particular. This tutorial will show you how to do both of these. Step 1: Click on Settings on the side menu. Step 2: Click on the Meal Plans tab. Step 3: Scroll on your screen until you see the area for managing the default meals of the day. You can now click the Add meal of the day and Remove buttons, as well as type in the input boxes to customize your meals in any way you see fit. In this example, we are deleting Snacks, and adding a pre-workout and post-workout meal. These portioning of meals for the day may be adequate for athletes, for example. Do not worry if not all of your plans will follow this structure. You will see later how to change the meals for a particular meal plan. Click on the Add meal of the day button until you have enough text slots to include all your meals (i.e. 5 in total in our example). Rename slot number 3 (Dinner) to pre-workout. Rename slot number 4 (previously snacks) to post-workout. Type in Dinner in slot number 5. When you are done editing your meals of the day, click on Save Changes on the top-right of the screen. The next time you create a new meal plan, you will see your meals of the day updated in the row headers of the table. This change in the settings will be effective for all future new meal plans. 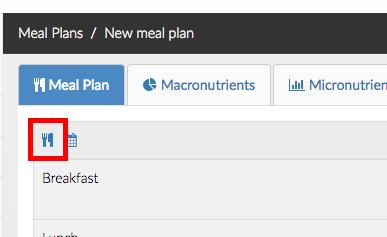 Old meal plans you have previously saved in NutriAdmin will not be affected automatically. Step 1: Open any meal plan. This can be a new meal plan, or an already saved plan. 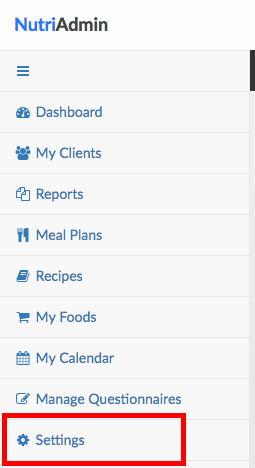 Step 2: Click on the fork and knife icon on the top-left corner of the meal plan table. Step 3: Customize the meals of the day for your plan. These changes will only affect the current meal plan. That's it! 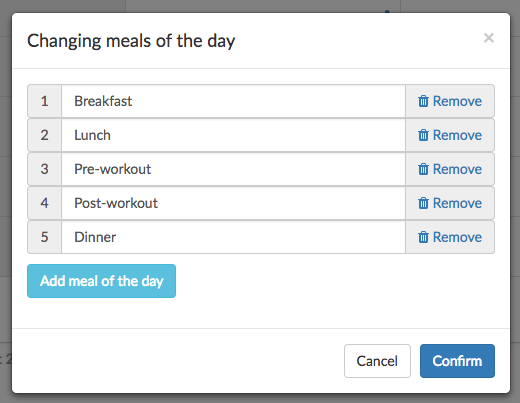 You can now customize the meals of the day for any meal plan in NutriAdmin.